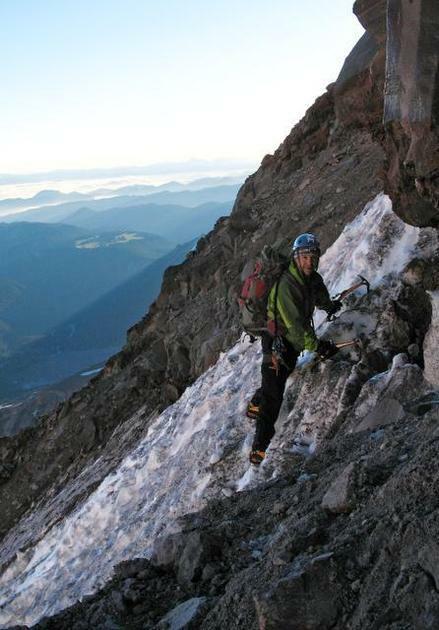 In the predawn hours of July 16, 2010, Terry Donahe, a fit and experienced mountaineer from Portland, was cautiously making his way up Liberty Ridge to the summit of Mount Rainier when he noticed something odd several thousand feet below him. Two headlamps were moving in the darkness, ascending quickly, much faster than his party was climbing. Donahe instantly knew he was witnessing an impressive display of fitness and mountaineering skill. "We are all very fit, very active and among the stronger climbers in the (Mazamas) club," Donahe said. "But these guys were in another league. I was truly in awe." The headlamps belonged to Jason Edwards of Tacoma and Phil Nicoletti of Enumclaw, and they were attempting something that's rarely done  a one-day climb of the steep Liberty Ridge route. Donahe, like almost every climber who does this route, took three days to reach the 14,411-foot summit of Rainier. Most climbers take an entire day just to hike to the base of the route. Edwards and Nicoletti did the entire route in 21 hours. In pulling off the feat, Edwards, 51, may have become the first person to make one-day climbs 25 years apart. "I know only a few climbers that have done a one-day climb... and only a handful that could do it at Jason's age, " said Eric Simonson, director of International Mountain Guides. "Jason trains very seriously so he is in great shape, plus he is a talented climber. I don't know of very many climbers that could do this, that is for sure." Edwards is a guide for IMG and a teacher at Puyallup's Stahl Junior High. 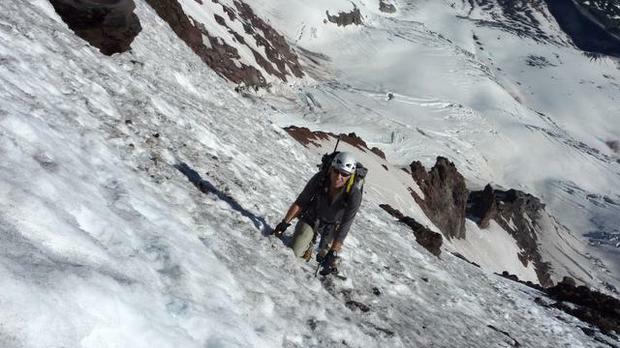 He has climbed Rainier 315 times, more than all but five people. Most Rainier guides with his experience level have long since stopped climbing the mountain for fun, but Edwards still loves spending some of his days off on the mountain. "It's a natural high," Edwards said. "I love the contrast on a one-day climb. I'm at home with my wife and talking to my mom, and it's a totally regular life scene. Then I'm up in the ice and rocks and crevasses working to my maximum. Then, on the same day I'm back doing the domestic scene again." "It's so bold, and it's so vivid." A one-day climb of Liberty Ridge is especially bold. On the north side of the mountain, Liberty Ridge is widely regarded as one of America's classic climbs. The route ascends 9,700 feet on slopes as steep as 55 degrees and over obstacles like an 80-degree ice pitch. The route is so steep that slipping often means falling to your death if you can't arrest in the first couple of feet. In 2004, two men died after tripping on the route and two others were swept down the mountain when they were caught by an ice fall. Climbing the route in a day as Nicoletti and Edwards did meant they wouldn't be taking the time to rope up and belay each other over the steepest pitches. As Edwards said, they'd essentially be "soloing with a partner." "People will say, 'How can you justify not using a rope,' " said Edwards, who carried a rope in case it was needed. "But we weighed it out and took an acceptable amount of risk." To go fast also meant they did not bring the gear they'd need to stay overnight should they get stuck by weather or an injury. "I'm impressed they have that much confidence in their skills to climb that way," said Donahe, who convinced Edwards to speak at his climbing club when he passed him. "But the rest of us mere mortals shouldn't try this." As a life-long guide, Edwards takes the risks very seriously. He and Nicoletti even postponed the climb for a day because the forecast called for high winds on the summit the previous day. They insisted conditions be absolutely perfect. "It's like aligning the stars," Edwards said. "If conditions aren't perfect you don't do it. You can't be wishy-washy. If you can't make a call, then you bail. I know I've made it when I leave (start climbing)." Edwards and Nicoletti left at 9:40 p.m. from White River Campground on July 15. Fueled by turkey sandwiches and energy gel shots, they reached the summit about 1:30 p.m. on July 16 and were back to the car by 7 p.m.
Edwards planned the climb to celebrate the 25th anniversary of his first one-day climb on the route. His first climb as a 26-year-old was only one hour faster. He said the route was more technical this time, requiring him to use his ice tool twice instead of once and accounting for the slower time. While Edwards is a veteran mountaineer with summits of the highest peak on each continent, Nicoletti is far less experienced. A 49-year-old Federal Aviation Administration flight controller, Nicoletti started climbing only five years ago. "I was a little apprehensive at first, " Nicoletti said. "But Jason had done it before, and I realized I just had to think positively. I needed to break it down into steps, do my best and focus on what is in front of me right now." Nicoletti was definitely fit enough to take on the challenge. A 10-mile mountain bike ride and a 17-mile hike wouldn't be an abnormal morning for Nicoletti. When most fit hikers do the 8-mile, 3,150-vertical-feet Mount Si hike near north Bend, they allow three hours or more. Edwards and Nicoletti need just four hours to do it twice. "He knows how to push his body and still stay in control," Edwards said. "I was impressed with his confidence and skills... He was super strong, and I knew he could do this even though he'd never done anything like it before." Nicoletti was able to do more than keep up. "Jason had another notch on the upper mountain," Nicoletti said, "but for the most part we were able to feed off each other when we were tired." When Donahe saw the swiftly moving headlamps below him his first thought was, "Those guys must be guides to be climbing that fast." He was stunned when he discovered he was only half right. "I was even more impressed to see a guy doing that who wasn't a guide," Donahe said. That's one of the most important reasons Edwards still climbs and guides. He loves to help people push the bounds of their physical fitness to accomplish things they might never have dreamed were possible. "I'm content in being alive and helping people," Edwards said. But in order to help others challenge themselves, Edwards knows he must keep doing the same for himself. 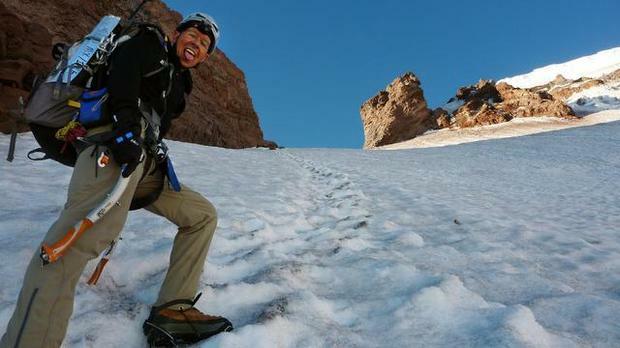 By the end of the summer he plans to climb Rainier twice in a day by two different routes. And by the time he hangs up his crampons for good he hopes to make one-day climbs of Curtis Ridge, and the Nisqually Ice Cliff. He'd also like to climb Rainier and Little Tahoma in the same day. "He still has a ball climbing," Nicoletti said. "He loves being out there. He likes the spiritual and physical aspects of climbing." What about another one-day climb of Liberty Ridge in 25 years at the age of 76? "Hmmm," Edwards said, pondering an idea most climbers would think preposterous. "I don't know. Sounds like an interesting challenge."